By starting with the basics, this book builds your knowledge step by step. 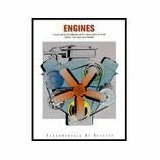 Chapter 1 covers how engines work. Chapter 2 outlines safety rules for working with engines. Chapter 3 deals with the basic engine--from cylinder heads through flywheels. The next four chapters examine the different types of fuel systems. Chapter 8 through 11 go into detail about an engine's related systems (intake, exhaust, lubrication, cooling, and governing) and their working parts. There is also an entire chapter on test equipment and service tools plus a complete diagnosis and testing chapter. The book ends with a chapter on how to perform a tune-up.